Front Wheel Shimmy-problem found and fixed. When I had my front forks rebuilt, I had my eldest son assist me with their installation back on the bike, this was done a few months ago - and have recently been on a 600km round trip on the bike. Had noticed a slight shimmy in the front wheel when cruising about 55-60km/h (35-40mph). It wasn't uncomfortable or worrying - more like the front wheel wandering a bit - but noticeable. I re-fuelled yesterday and when I got home I was just checking on the wiring harness going into the left pocket area and looked down to see exposed threads on the lower triple clamp of both pinch bolts. Reached down and found they were both loose- the lower bolt was firm to move, but the top bolt was able to be turned easily. Straight out with the 12mm ring spanner and tightened them both up - needless to say the slight shimmy has now disappeared. All my fault as I usually check and double check things. This time I relied on my eldest son - he is also now aware of the issue - as he thought I had tightened them up. Re: Front Wheel Shimmy-problem found and fixed. Lucky you caught that before it came all the way off. I always go back over everything twice after I have stuff off my bike. If I forget I can only blame myself. thanks - it was nice to find it in the driveway and not have something bite you when on the highway. I try to make a point of doing a once-over of critical fasteners like that once I'm done, just to be sure. 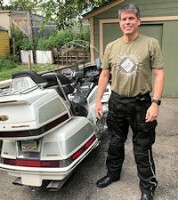 I remember reading about a guy who rode a GL1200 to Alaska, he started having a wobbly front end. He couldn't find the problem so he stopped in a small bike shop in the middle of nowhere. The mechanic had a look and came out with a white face. Turns out the nuts holding the axle holders on the front wheel hadn't been torqued - two of them on one side had fallen off and the axle holder was long gone, one nut on the other side had also fallen off, so the only thing holding the front wheel in place was one remaining (loose) axle holder nut. would you be game to keep riding it - knowing the problem?